The hospital environment for a caregiver is fast-paced and demanding. The mobile and wall-mounted workstations you use day in and day out should be able to keep up with you without failing. That’s why you want a solution that is not only ergonomically designed and easy to use, but also durable and long-lasting. Many of our competitors have released carts with unsafe battery technology making hospital staff leery of battery powered mobile workstations. Our Clio powered carts utilize LiFePO4 (Lithium Iron Phosphate) battery technology; recognized as the safest in the industry. The LiFePO4 chemistry was designed for the healthcare environment with safety, long hours, and continuous use in mind. This technology is proven to be a great solution that provides healthcare professionals with the safest and reliable power solution. The LiFePO4 is a much safer battery compound than (LiCoO2) used in competitors’ Li-ion batteries. Various MSDS (Material Safety Data Sheets) show other lithium-ion chemistries are extremely hazardous and can be very harmful if exposed and are subject to fires. Comparatively, LiFePO4 MSDS show this chemistry is a much safer substance than Li-ion. 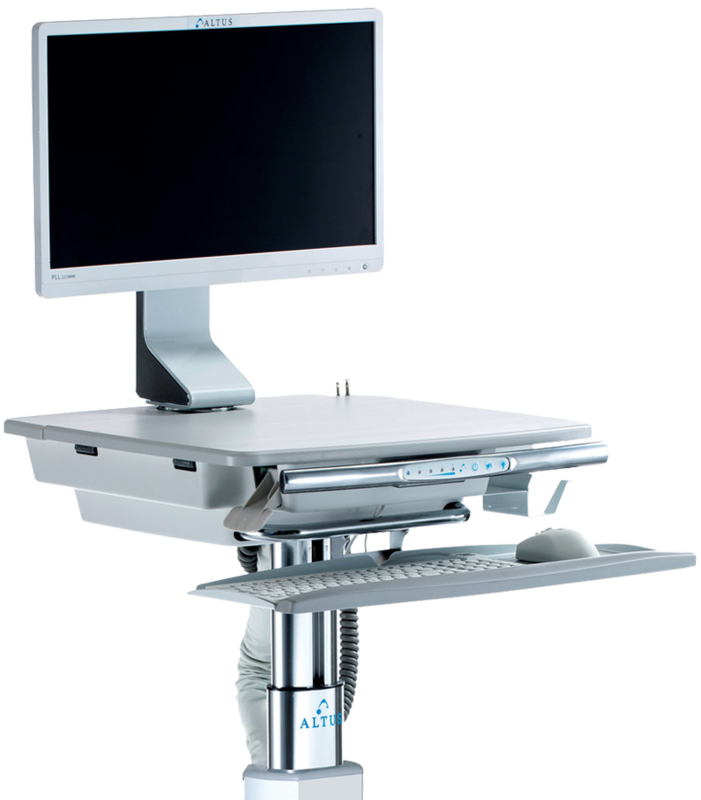 Altus mobile and wall-mounted workstations are designed to meet the needs of a rugged workday while taking care of each caregiver’s ergonomic workflow demands. Our sleek, yet practical design is intuitive and built to last. Clinicians can understand and start using our products within minutes. We build carts that last much longer than anticipated in order to give customers the best return on their investment. Durable and sustainable workstations need to last longer than the average 5 year lifecycle. That is why Altus’ mobile and wall-mounted workstations are engineered with solid yet lightweight cast aluminum and steel for years of constant use. Primarily constructed of metal, not only do the workstations hold up to the rigors of everyday use, but they are also aesthetically pleasing. Along with the metal construction, our impervious thermofoil worksurfaces help healthcare facilities create a clean, calming, and healing aesthetic. Our work surfaces have built-in safety with sturdy non-porous surfaces able to withstand even the harshest cleaning agents without degrading. With our smooth finish and color flexibility, healthcare environments can be easily designed with patients and caregivers in mind. Altus designs and manufactures mobile and wall-mounted technology workstations at our state-of-the-art headquarters in Grand Rapids, Michigan. Durability and reliability are core attributes of Altus designed products. We understand the demanding environment of healthcare facilities and design our products to last. Have confidence in choosing Altus. Our comprehensive warranties are designed to provide you with options to further protect your investment. We offer a Standard Limited Warranty with all of our products as well as extended warranties with parts and labor, installation, maintenance, and training services. We can customize a solution that fits your needs and gives you confidence in your investment. Over the last two years, less than 1% of our carts required service fixes and many of our carts are still in service after 10+ years.